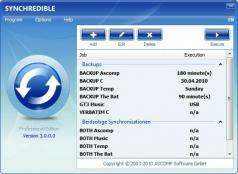 Synchredible is a straightforward application that’s free for non-commercial use and offers various methods for backing up files and folders, so you can be sure you’ll never lose them in case of accidents, theft or data corruption. The intuitive interface makes it a great choice even for those with little or no technical experience, but it also bundles an impressive collection of advanced features which are normally found only in commercial software. Creating tasks along with all the configuration they involve is extremely easy thanks to the built-in wizard which guides you through the whole process. The tool offers a task manager so you can schedule sync jobs according to your needs. All you need to do is choose the two disk drives or directory then ask the app to copy items from one location to the other or equalize directories. The latter option will copy files between the two folders until both have exactly the same content. Synchredible also provides numerous filters you can apply like the possibility to delete unnecessary files and folders, comparing file contents to skip duplicate, exclude certain file extensions or files and many more. Quick defrag files without the need to defrag the whole disk.